Wilmington, DE (September 13, 2018) – Delaware-based Iron Hill Brewery and Restaurant is thrilled to announce the opening of their first Center City Philadelphia location today in the exciting new East Market development. Doors opened to the public this evening, September 13 at 5:00 p.m., Iron Hill Center City, which is located at 1150 Market Street and marks the 15th brewery and restaurant for the group. This is the third opening for Iron Hill in 2018 with a fourth slated for November in Hershey, PA, as part of an aggressive growth strategy. Founded by home brewers Kevin Finn, Mark Edelson and restaurateur Kevin Davies in Newark, DE in 1996, Iron Hill Brewery & Restaurant has blossomed from one restaurant and brewery to 15 locations up and down the East Coast, including Pennsylvania, Delaware, New Jersey and South Carolina. Each brewery/restaurant has their own scratch kitchen and craft brewery, allowing individual chefs and brewers the creativity to pair the freshest ingredients with the highest quality grains and hops. For 21 years, Iron Hill has incorporated beer in everything they do. As a result, Finn, Edelson and Davies are viewed as innovative business leaders in their home state of Delaware and in the Mid-Atlantic region. 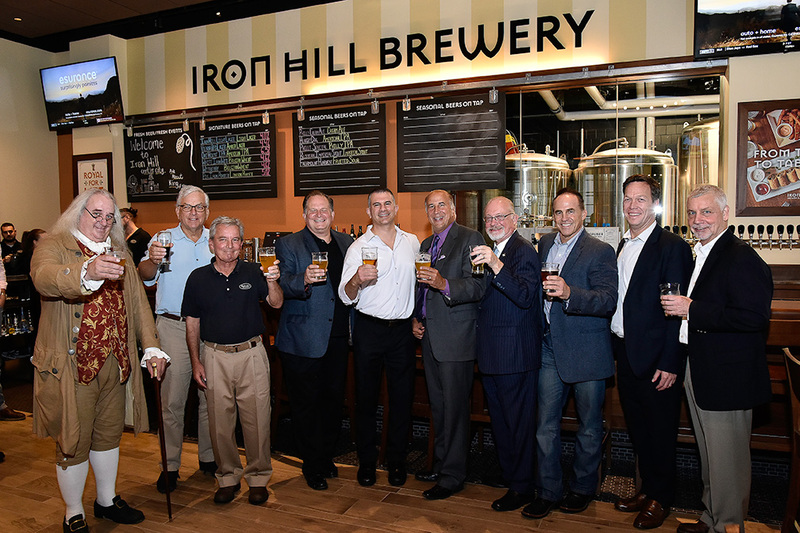 They started Iron Hill at a time when small breweries were just beginning to gain mass appeal around the country and their entrepreneurial, forward thinking helped build them into what they are to date. Each individual location has its own head brewer. Each location dedicates itself to the freshest ingredients and friendly atmosphere for all age groups – helping change overall perceptions about brewpubs one meal, one pint, one community at a time. Newark, DE (147 East Main Street, 302-266-9000); Wilmington, DE (620 Justison Street, 302-472-2739); Media, PA (30 East State Street, 610-627-9000); West Chester, PA (3 West Gay Street, 610-738-9600); North Wales, PA (1460 Bethlehem Pike, 267-708-2000); Phoenixville, PA (130 East Bridge Street, 610-983-9333); Lancaster, PA (781 Harrisburg Pike, 717-291-9800); Maple Shade, NJ (124 East Kings Highway, 856-273-0300); Voorhees, NJ (13107 Town Center Boulevard, 856-545-9009); Chestnut Hill, PA (8400 Germantown Avenue, 215-948-5600); Ardmore, PA (60 Greenfield Avenue, 610-228-2280); and Huntingdon Valley, PA (785 Huntingdon Pike, 610-602-9255); Greenville, SC (741 Haywood Rd. 864-568-7009); Rehoboth, DE (19815 Coastal Highway, 302-260-8000), Philadelphia, PA (1150 Market Street, 267-507-7365) and Hershey, PA location expected to open in November 2018.